Click the Plot button on the Quick Access toolbar. The Quick Access toolbar is at the left end of the program’s title bar, just to the right of the Application button. The Plot icon looks like an ordinary desktop printer. AutoCAD opens the Plot–Model dialog box, with the title bar showing what you’re plotting (Model, in this case). Click the More Options button. It’s in the lower-right corner of the dialog box, next to the Help button. The Plot dialog box reveals additional settings. In the Printer/Plotter section, select a printer from the Name drop-down list. If in doubt, the Default Windows System Printer usually works. 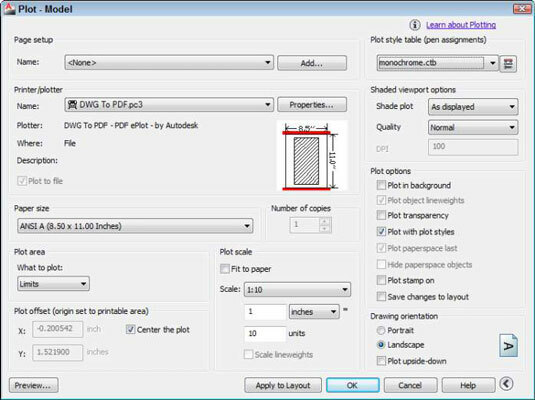 In the Paper Size section, use the drop-down list to select a paper size that’s loaded in the printer or plotter. Anything Letter size (81/2 x 11 inches) [A4 (210 x 297mm)] or larger works for this example. In the Plot Area section, select Limits from the What to Plot drop-down list. This is the entire drawing area. In the Plot Offset section, select the Center the Plot check box. Alternatively, you can specify offsets of 0 or other amounts to position the plot at a specific location on the paper. In the Plot Scale section, deselect the Fit to Paper check box and choose 1:10 from the Scale drop-down list. The 1:10 option is the scale that’s used to set up the drawing. You receive no prize for guessing the metric equivalent of 1:10. In the Plot Style Table (Pen Assignments) section, click the drop-down list and choose monochrome.ctb. The monochrome.ctb plot style table ensures that all lines appear in solid black rather than as different colors or weird shades of gray. Click Yes when the question dialog box appears, asking Assign This Plot Style Table to All Layouts? You can leave the remaining settings at their default values. Some printers let you print closer to the edges of the sheet than do others. To find out the printable area of your own printer, move the mouse pointer to the postage-stamp-size partial preview in the middle of the Plot dialog box and pause. A tooltip appears, listing the paper size and printable area for the printer and the paper size you selected. If the plot scale you entered in the Plot dialog box is out of sync with the drawing’s annotation scale, the Plot Scale Confirm dialog box appears, advising you that the annotation scale isn’t equal to the plot scale. This drawing doesn’t contain text or dimensions, and you didn’t make the hatch annotative, so you can click Continue to generate the plot. Annotative scaling controls the printed size of text, dimensions, hatching, and other types of annotation objects at plot time — as long as the drawing’s annotation scale matches the plot scale. Press pick button and drag vertically to zoom, ESC or ENTER to exit, or right-click to display shortcut menu. Right-click in the preview area and choose Exit. If the preview doesn’t look the way you want, adjust the settings in the Plot dialog box and click the Preview button again. Continue to adjust the settings until the plot looks right. The Plot Scale Confirm dialog box pops up again. You may be tempted to click Always Continue Under These Conditions, but it’s not recommended until you’re more familiar with annotative objects. Click the Close (X) button in the Plot and Publish Job Complete balloon notification. If you’re not happy with the lineweights of the lines on your plot at this point, fear not: You can use the lineweights feature or plot styles to control plotted lineweights. Press Ctrl+S to save the drawing. You successfully executed your first plot in AutoCAD.